All entrants will be recognized at a ceremony to be held in June. FOR THE STUDENT: Check the essay for the following: the FONT is Times Roman 12 point, the file FORMAT is Word (not PDF), the LENGTH is 400-800 words, the CONTENT not only discusses the champion but also how they influenced you to “be a champion”, and have run a SPELL-CHECK and grammar-check on it. FOR THE PARENT: When you complete the form (next page), please (1) PRINT the Entry Form, (2) SIGN the printed forms provided by the teacher and (3) take a PHOTO of the signed form using your phone or a digital camera, and (4) either ATTACH the image file to the form or REPLY to the Entry Confirmation e-mail you will (or would have) received* and (5) ATTACH the photo image file to the email. * The parent, teacher, student, and school would have each received an Entry Confirmation e-mail for each e-mail address that was provided! 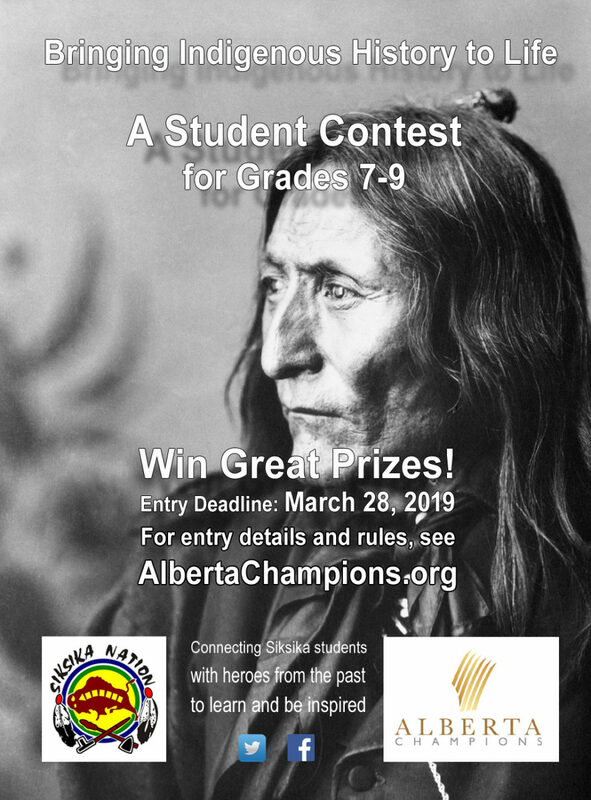 We are pleased to announce we will be running a contest for Indigenous students, focusing on heroes from the Siksika Nation in Alberta.